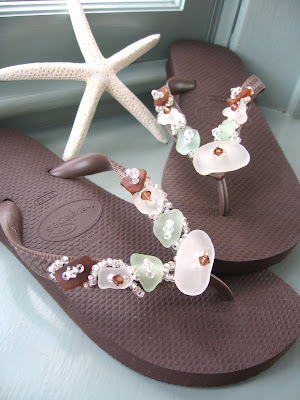 Boston Handmade: New For Spring/Summer '09 - Sea Glass Flip Flops! New For Spring/Summer '09 - Sea Glass Flip Flops! 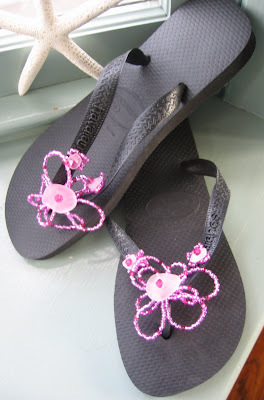 You heard it right - I have just launched my line of all new and original sea glass flip flops. These are made with hand picked sea glass from the North Shore - MA. Each pair has the drilled glass applied... each pair is hand beaded and tied. Only the finest components are used... natural stones, glass beads, freshwater pearls, shell beads, swavorski crystals and more! Sink your feet into the best quality Havaianas - 100% buttery soft rubber from Brazil. These are, in my opinion, the best and most durable flip flop on the market. Each pair is made with care - and the more involved ones take an entire day to make. These are already getting a lot of attention so get them now and start the trend! Shop my store - Sea Glass Things - to purchase or contact me to special order! It is never to early to make your feet happy! I love the orange ones! these are totally groovy. nice work!!! These are very cool, great idea!